Back in the 1950s every company was trying to stake out its “turf” and when it came to model armor and military kits that was quite true. Aurora jumped out at 1/48, Revell and its ally Adams went for 1/40 scale kits, Renwal went for 3/8" scale (1/32) and Monogram was caught in the middle. Their solution was to offer “box scale” which was nominally referred to as 1/32; it was not, and measuring the handy scale guide in the original directions shows it to clearly be 1/35 scale. Their kits came out with odd choices of numbers as all of the military kits were PM (PA was aircraft and PC were cars) so this was actually Monogram’s 37th plastic kit and not their 37th military kit. As it was the 1950s, everything had to work. The kit features rotating wheels (if you were very careful with assembly, which most kids in those days were not), rotating tracks (sturdy vinyl units), opening hatches, traversing turret and cupola, elevating main and machine gun, and four figures (commander, ½ figure of driver, and two infantrymen with “shadow” bases). While the kit was quite accurate for its day (only Revell/Adams kits were close) it was very simplified for its time, which today makes it very much a creature of the past. 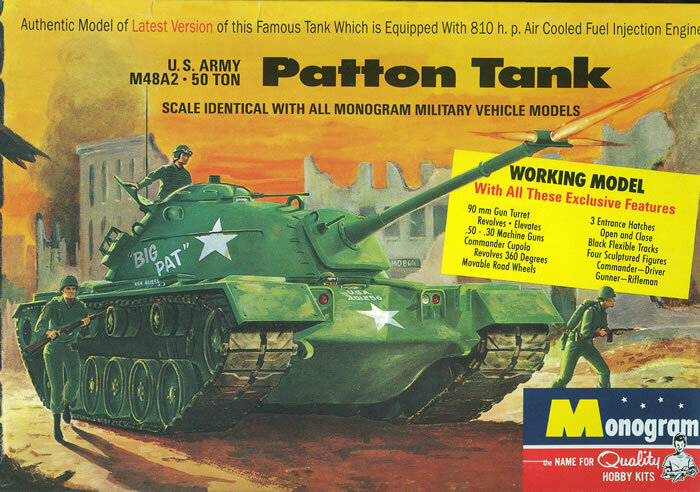 For years it was the “go to” kit for kitbashing with the much better Tamiya M48A3 kit if you wanted an A2 version but now – with new kits coming from DML of the M48A3 series and Revell (Germany) with a new A2 kit, its time has pretty much expired. But the kit does have two big advantages. One, it is only about US$23 at full retail so by the standards of the day is “dirt cheap”. And two, with its low part count of 135 parts is a great starter kit for the new modeler or the youngster. About half the cost of some video games, it is a great way to get into modeling and due to the simplicity of the kit (other than the wheel fasteners) is not going to generate the frustration level of an 1100 piece T-72B or 1300 piece Tiger I.
Revell-Monogram is still “milking” the molds and has recently re-released the kit so anyone who is thinking of getting into armor modeling (and starting simple) or wants to get a son or daughter involved (it can happen!) should consider this kit.